The Allie 24 inch vanity brings to you good looks and generous storage. An uncomplicated design scheme gains luster from the sophisticated Twilight Gray finish with matte gold trim and hardware. A solid birch wood frame, plywood drawer boxes, dovetail joints, a convenient toe kick, and soft-close glides and hinges testify to the quality of construction. A large open shelf provides ample storage. Complete the look with matching mirror, mirror cabinet, and linen tower. Allie is all you need to make your bathroom amazing. If a products fails due to defects in materials or manufacturing during the one-year warranty period, Avanity will either authorize a full product replacement, a parts replacement, repair, or alternative renumeration at its discretion. Inspired by mid-century modern console design, the Coventry Collection from Avanity features solid teak construction with minimal ornamentation. The 72 inch gray teak Coventry features soft-close doors and drawers, sturdy and stylish splayed legs, and an abundance of storage space. Teak is the perfect material for bathroom furniture, as it is both durable and water resistant. With Coventry form follows function with superb simplicity. The Dexter 43 inch vanity cobmo offers a combination of styles where country meets contemporary. From its Rustic Gray finish to it striking metal inset, Dexter blends rural and industrial details to create an intriguing cabinet that will be the centrepiece of your bathroom. A solid ash wood frame, soft-close hinges, and simple pulls finished in black bronze complete the look of this unpretentious but beautiful piece of bathroom furniture. The combos includes a gray quartz top and rectangular undermount sink. A matching mirror is also available. Dexter defines modern bathroom design. Add a breath of fresh air to your bathroom with the Jameston Collection from Avanity. With its open cabinet and solid teak construction, the Jameston 32-inch vanity combines functionality with beauty. Two soft-close drawers provide additional storage for organizing towels and toiletries. Teak provides durability without sacrificing elegant styling. Available in both natural and rustic teak finishes. 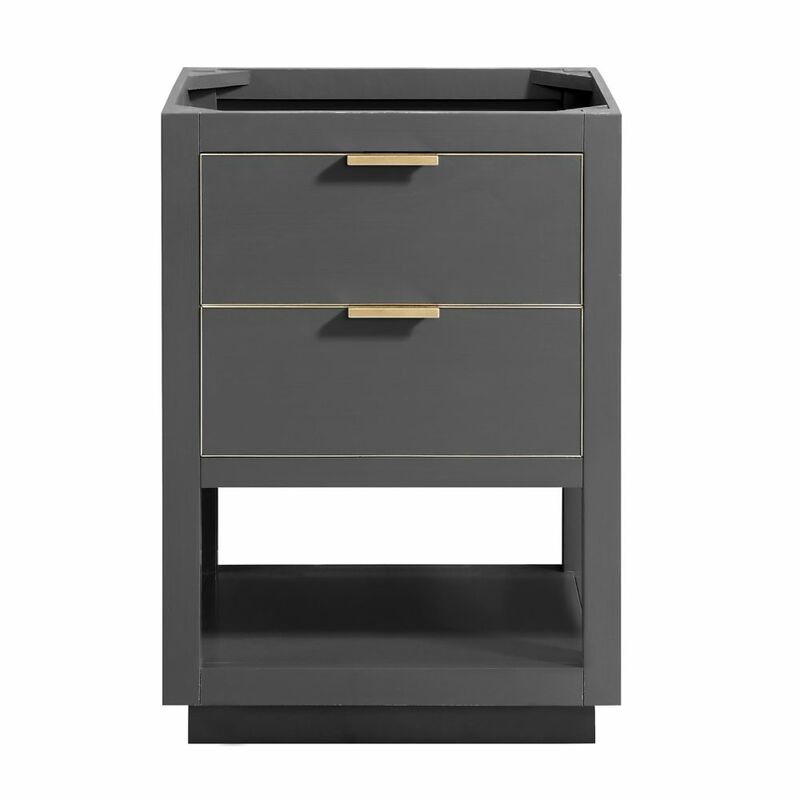 Form meets function with this classic 24" gray Bosconi vanity. The simple modern lines are accentuated by the ceramic integrated sink and vertically mounted vanity mirror. Versatile features include a single cabinet with soft closing doors, spacious enough to store towels, toiletries and accessories. Allie 24 inch Vanity Only in Twilight Gray w/ Gold Trim The Allie 24 inch vanity brings to you good looks and generous storage. An uncomplicated design scheme gains luster from the sophisticated Twilight Gray finish with matte gold trim and hardware. A solid birch wood frame, plywood drawer boxes, dovetail joints, a convenient toe kick, and soft-close glides and hinges testify to the quality of construction. A large open shelf provides ample storage. Complete the look with matching mirror, mirror cabinet, and linen tower. Allie is all you need to make your bathroom amazing.